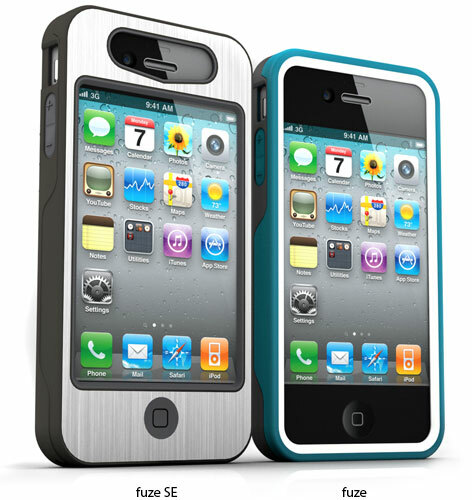 iSkin has released its Fuze and Fuze SE cases for the iPhone 4S and iPhone 4. Both cases offer tough protection with a dual-layer, slim-profile design. The Fuze and Fuze SE cases feature hybrid material construction with a hard polycarbonate exterior shell and a soft, shock-absorbing inner core. The cases feature a two-piece snap style for easy installation, covered buttons, a built-in removable dock connector cover while the Fuze SE case offers additional screen protection with a brushed aluminum front plate with a covered home button. iSkin's premium hybrid iPhone cases continue to cost a small fortune compared to most case brands with the Fuze case costing $50 and the special edition Fuze SE costing $60. iSkin's Fuze case is available now in three two-tone colors while the Fuze SE is available in black with a silver brushed aluminum. Video after the break.